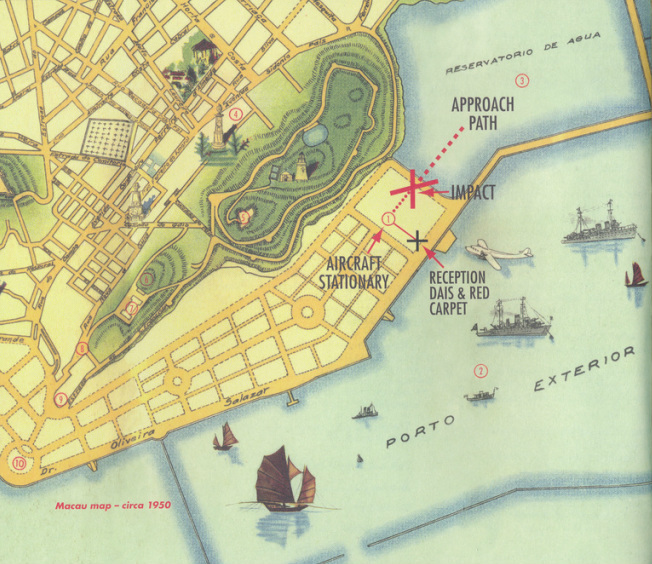 The then-Portuguese enclave of Macau, about 40 miles west of Hong Kong, caught Pappy's (Farrell) attention. He reasoned that any short-haul operation meant a plane could complete several return flights each day with no catering requirements, and the short lines of communication meant that engine or airframe problems could be quickly rectified. Above: BETSY’s approach profile. The large red cross is the contact point with the reservoir retaining wall - the small black cross indicates the reception dais abreast of the red carpet and, Left: in more detail. A discussion with P. J. Lobo's eldest son, Rogerio "Roger" Hyndman Lobo, gained his support. However, before making an official application, he decided it was prudent to check the C-47's performance on a grass area (pre-war racecourse) at Macau. On September 1, 1946, Peter Hoskins made several landings and take-offs from the enclave's pocket-size field in Betsy. The proving flights determined that the limited length of the grass field was feasible, but that a precise final approach speed and touchdown point was vital. Above: Extract from Capt. George Peter Hoskins’ Log Book. It shows several historic events in the early life of RFEIC/CPA – the Macau proving flights – the final flight of BETSY under her American registration NC 58093 (to Sydney) – the time it took the Australian engineers to modify her and her return to Hong Kong under her new registration of VR-HDB. On September 20, using Peter's report as a basis, Syd wrote to Papa Moss, the Director of Air Services, Hong Kong, requesting consideration for scheduled operating rights between the colony and Macau. 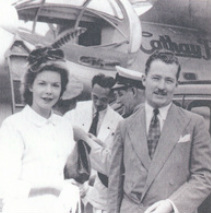 Three days later, Pappy and Syd signed the Memorandum and Articles of Association of Cathay Pacific Airways, and it was incorporated the next day - September 24, 1946. At the beginning of January 1947, Lisbon and London were still considering Cathay Pacific's application to start such a service. However, in the interim they were permitted to begin operations as a non-scheduled carrier utilising the C-47. An official reception was planned for the inaugural flight on January 5, 1947. In Macau, local dignitaries, in the trappings of their office, keenly assembled at the end of a red carpet to watch Niki make her landing. Pinky Wawn, assisted by co-pilot Syd, had her approach speed captured to the knot. Capt. Pinky Wawn, in Great Western & Southern Airlines uniform, UK -1939. Another of the Roy Farrell Export-Import Company's partners, standing between the pilots, got a bit toey at the flat approach. He stood it until his nerve failed and with an oath he scuttled back to the cabin. His rapid retreat upset the delicate balance of the precisely flown plane and the already-extended wheels clipped the retaining wall of the reservoir. The field lay just beyond the retaining wall of the Reservatorio de Agua, the water supply of the enclave. The strike folded back the undercarriage and Niki's props tore out great divots of earth and grass. Out of control, she slid on her belly and stopped with the cabin door lined up with the red carpet. The door opened and a thoroughly sheepish crew stepped down. Under the impression that this was part of the show, the band's trumpet section heralded the occasion, and the spectators went wild. The crew lined up before the welcoming committee and its spokesman delivered his congratulatory address as though nothing untoward had happened. Here was savoir-faire at its blindest! Naturally, Cathay Pacific was upset with the loss of Niki's earning capacity, as was the crew for causing the damage. The event was a blessing in disguise, however, for it clearly showed the C-47 did not suit that small field. Fortunately, the accident did not have an adverse effect on the future grant of the Macau operating rights and led to the introduction of the Catalina service. From January to April 1947 Niki was out of commission. This picture shows Bill Hokum Harris’ men working under sun protection awnings. Left to Right: Chief Engineer, Bill 'Hokum' Harris, R/O W.J. 'Bill' Carew and Neil Norquay. On April 20, 1947, Cathay's Hokum Harris, Bill Carew and Neil Norquay put the finishing touches to Niki and Pinky Wawn flew her back to Kai Tak. To the best of my knowledge, this was the last flight made by any C-47 to or from Macau. 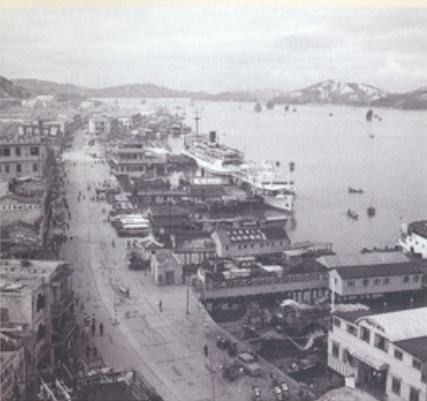 A 1950's view of Macau's Inner Harbour, with Hong Kong steamers alongside the waterfront.